One thing I like about Design Houses is when they turn their hand to watches. Mostly dress watches it has to be said, but these are often great looking pieces, produced not by watch trade people, but by designers of different products and what is their take on a watch to express their particular Company or philosophy. This is a neat and rather stylish model from Christofle of Paris and a particularly handsome piece it is too – well to my mind it is, as I bought it just the other day at auction. And at a VERY reasonable two digit price. Now considering this model cost in 1999 approximately £1300 and it’s in perfect condition (box, papers etc) – I’m well pleased. It is a decent specified model too with a 21 jewel Swiss ETA 2892-2 automatic movement, Sapphire Crystal and (possible) 18ct gold bezel on a rather elegant stainless steel case, plus articulated “fancy” lugs connecting to the Swiss original green colored Lizard leather strap with signed Christofle stainless buckle. Readability for me is a basic buying principle and I do like the jet black polished color of the hour and minute hands, which gives excellent contrast against the textured inner dial. The outer track is on a broad gold colored band with black Roman numerals. The Date aperture is @3 with contrasting black date numbers against white. The sweep second hand is in gold. Dial lettering features the Christofle logo and Paris and below shows Automatic with Swiss Made at the foot of the dial. 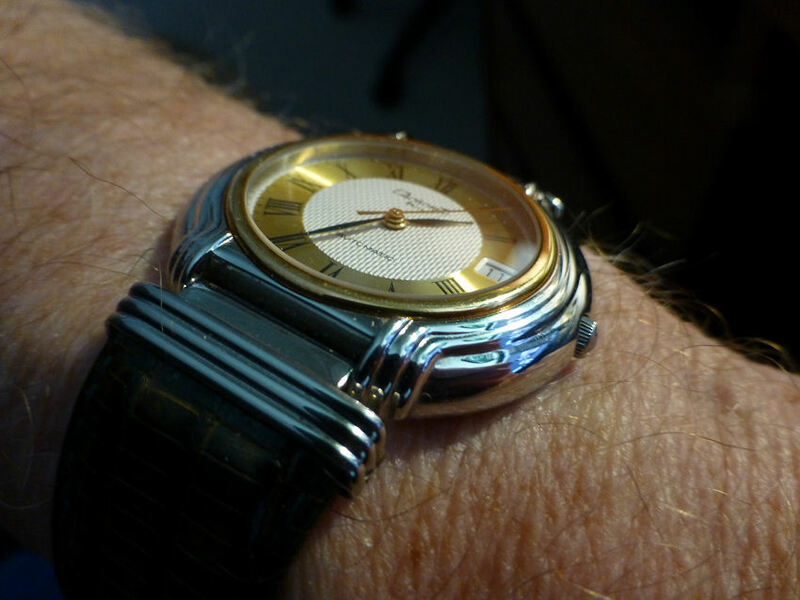 Note the fluted stainless steel case shaping – plus articulated lugs. It sits very well on the wrist and at just 37 mm diameter and quite thin at 8.5 mm, it looks neat and the dial color combination with the green Lizard strap lends itself very well to the dress occasion. As watches go it is a good mid range model, though for me I would balk at paying the new price, which reflects the design house premium. But for the price I paid and as this watch is in perfect, as new, condition, it is a really good buy. One of the reasons why Designer watches in general can be excellent pre-owned purchases, is that the new designer inflated price disappears in the second hand market. And unlike previous times, today many of the designer outlets produce some very, very good watches indeed and well worth a look at Auction price. 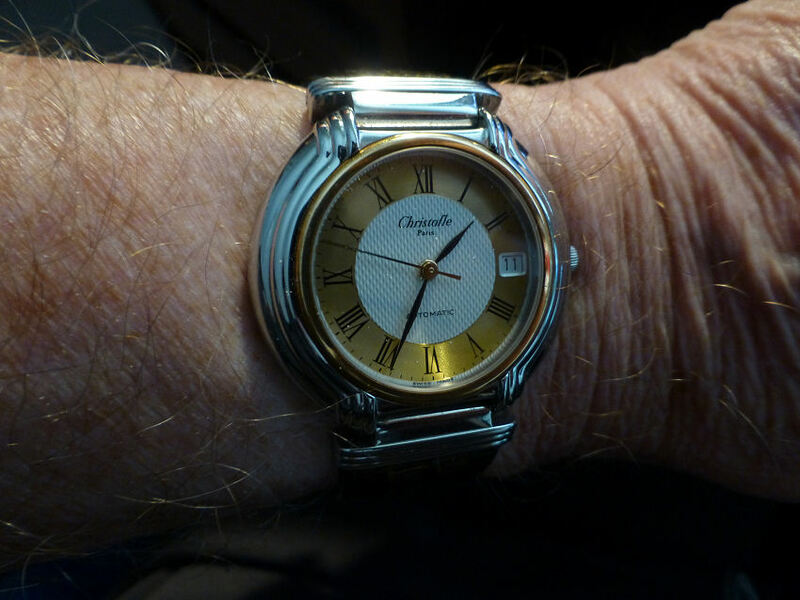 This entry was posted in Fashion & Designer, Spotlight, Watch reviews and tagged automatic, Christofle, ETA2892-2. Bookmark the permalink.